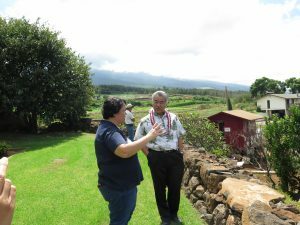 Maui farmer Heidi Watanabe talks story with the governor. • Agriculture expanded statewide – Making Hawai‘i more self-sufficient and food secure is one of my top concerns. That’s why we have a plan in place to double local food production by 2020 with the state purchase of farmlands, programs that offer more support to farmers and incentives to grow organic and create business incubators to help encourage a new generation of farmers. • State’s first Hawai‘i Interagency Biosecurity Plan developed – Combatting invasive species is a big part of expanding agriculture. That’s why the Ige administration has created a comprehensive, 10-year biosecurity plan to protect the state from the impacts of invasive plants and animals. Government agencies and community partners will coordinate efforts, including new challenges due to climate change.